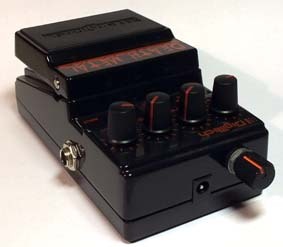 This mod gives you some control over the über-distortion this pedal produces. The idea is to replace the fixed feedback resistor of the second op-amp stage (just before the clipping part) with a potentiometer + series resistor thus reducing the gain. This is a little tricky operation because of SMD-components, closely placed parts and a delicate multilayer pcb. So, some experience and proper tools are recommended if you try this - at least don´t blame me if you ruin your pedal. The resistor in question is R16 (120k). I managed to remove the part without accidents. I used solder wick and slightly lower temperature with my soldering station. 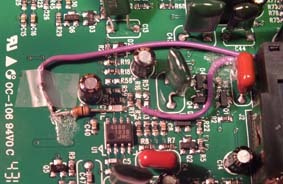 After I got most solder out I used sharp forceps with the soldering pen to finish the job. Not the most sophisticated way I know, but it worked anyways. 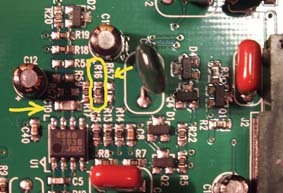 I decided to solder the series resistor to C10 (marked in the pic above). The other wire is soldered to the lower pad of R16. I used a 100k linear pot with a 10k series resistor. Of course you can experiment with other values as well. I had to place the pot at the back panel, no room elsewhere. Actually that is not as inconvenient as you might think. If I can see the orange line on the knob I know the gain is close to max. Otherwise I have left it at rhythm position. This new control has an interesting effect on the sound. 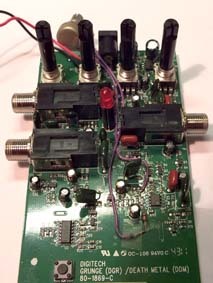 Not like an ordinary gain control, instead it works like a sustain/feedback control. At fully clockwise you still get that over-the-top distortion. When you reduce the gain the distortion remains but sustain and feedback are reduced. You can actually play chords! You also get more dynamics and control. Sound becomes less compressed. Overall I´m happy with the result. Since I play mostly rhythm parts the original distortion was a little too much, especially with a high output microphone. Using guitar´s volume pot to control the distortion was just too inconvenient for me. You could also use a toggle switch instead of the potentiometer to select between two fixed resistors. One for lead and other for rhythm. A pot gives more control though.